In this tutorial, we'll learn all about the updated Start screen, or Start workspace as it's officially known, in Photoshop CC 2017. The Start screen was actually introduced back in Photoshop CC 2015, but in CC 2017, Adobe has streamlined it a bit and made a few important changes, all of which we'll look at here. 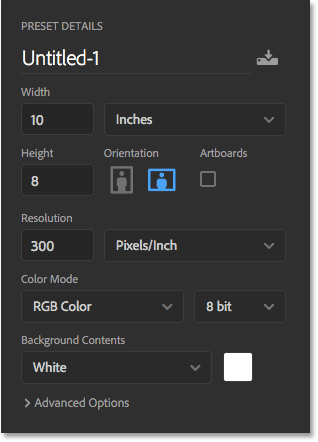 The biggest change, though, isn't really with the Start screen itself but with the New Document dialog box which has been completely redesigned in Photoshop CC 2017. We'll look briefly at it here as we make our way through the Start screen's features, but I'll also cover it in much more detail in its own separate tutorial. 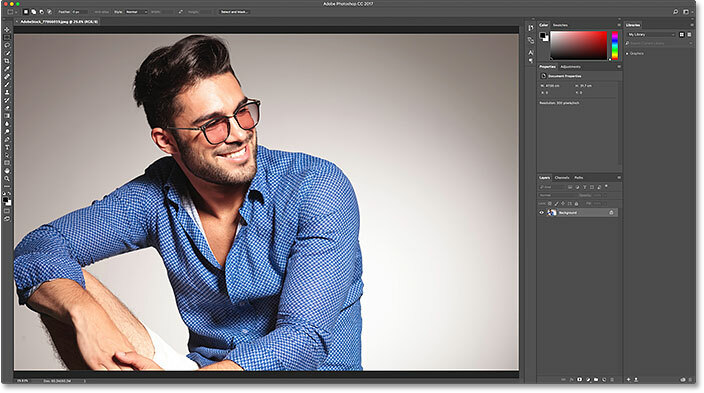 To follow along, you'll need to be using Photoshop CC (Creative Cloud) and you'll want to make sure that your copy of Photoshop CC is up to date. Let's get started! 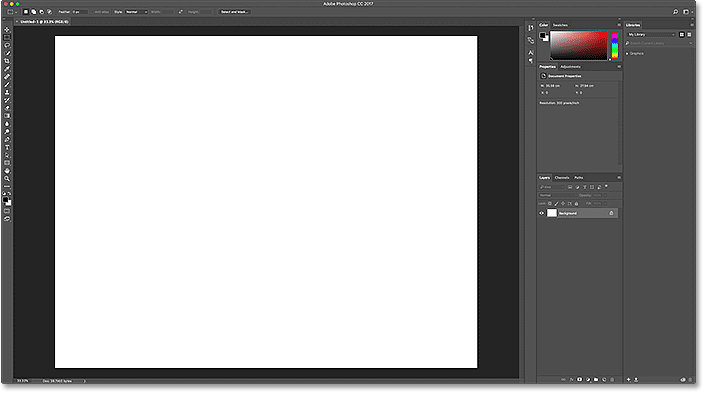 Photoshop's Start screen gets its name from what it does; it gives us a place to start. Before we can do any work in Photoshop, we first need something to work on, and that's where the Start screen comes in. 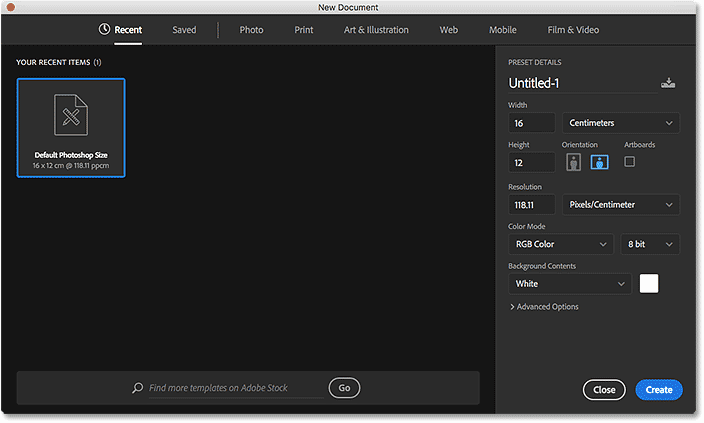 We can use the Start screen to create a brand new Photoshop document, or we can use it to open an existing image. The Start screen appears each time we launch Photoshop on its own, meaning we haven't yet selected a document or image to work on, and it appears whenever we close out of a document and have no other documents open on the screen. Along the left of the Start screen is the main menu. 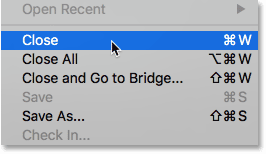 We'll cover each menu option (all 4 of them) as we go along, but for now, notice that RECENT FILES is selected by default at the top. If I had any recently-opened files (which I will shortly), they would appear in the center of the screen where the instructions are currently displayed. 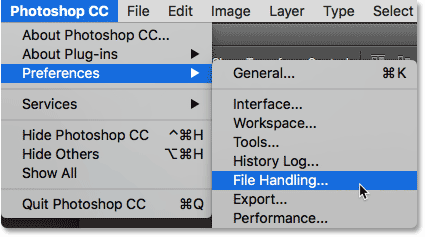 Below RECENT FILES is CC FILES, a brand new addition to the Start screen in Photoshop CC 2017. 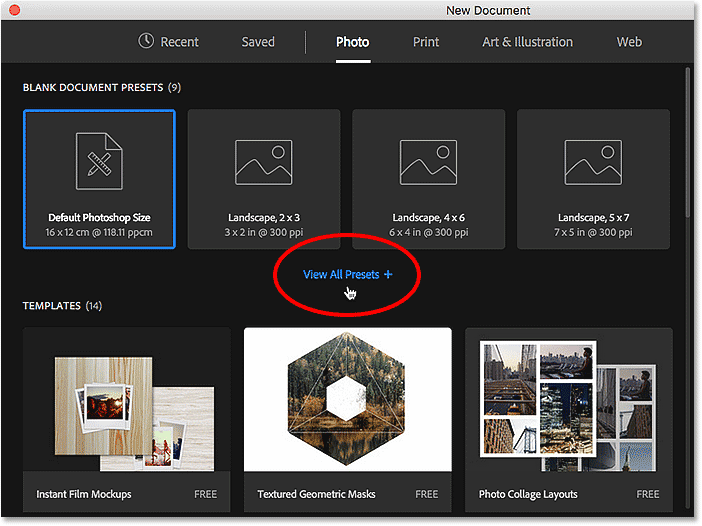 The "CC" stands for Creative Cloud, and this option lets us open any Photoshop PSD files that we've stored not on our local computer but in the cloud—the online storage that Adobe gives us as part of our Creative Cloud subscription. The Start screen's main menu options. The dynamic tiles along the bottom of the Start screen. 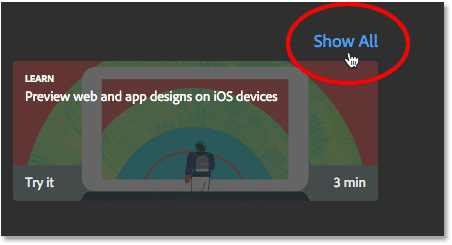 Clicking the Show All button. Choosing a document type from the menu. This displays a collection of preset document sizes that we can choose from based on the type of document we selected. 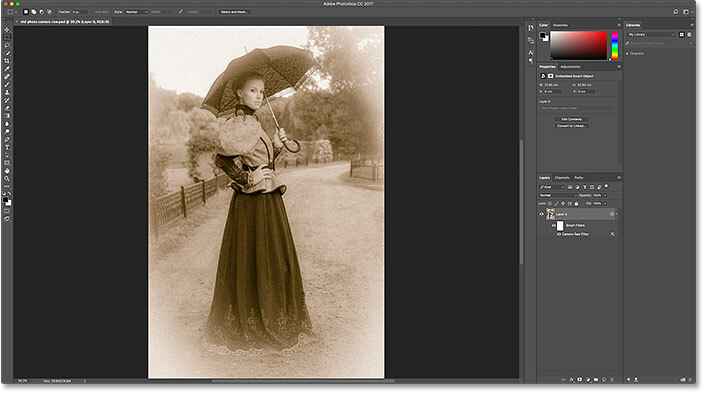 Since I chose Photo, I'm seeing presets for common photo sizes, like Landscape 2x3, Landscape 4x6, and Landscape 5x7. Below the presets is a collection of templates (new in Photoshop CC 2017) which we can download from Adobe Stock. 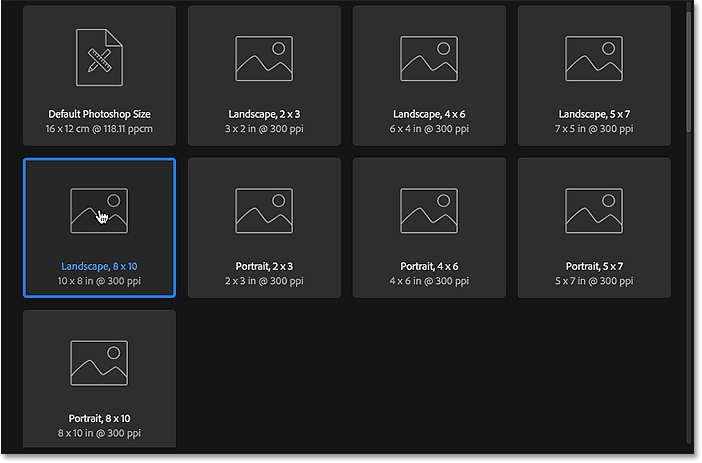 The templates allow us to add our images to pre-made layouts and effects. You'll see different templates depending on which document type you've selected. Using templates is a whole other topic, so we'll skip them for now and focus just on the presets. The PRESET DETAILS column shows the settings that will be used. Customizing the settings and clicking the Create button. The Start screen reappears after closing the document. That was just a brief glimpse at the redesigned New Document dialog box in CC 2017. There's a lot more to cover, and you can learn all about it in our How To Create New Documents In Photoshop CC tutorial. Navigating to, and selecting, an image to open into Photoshop. 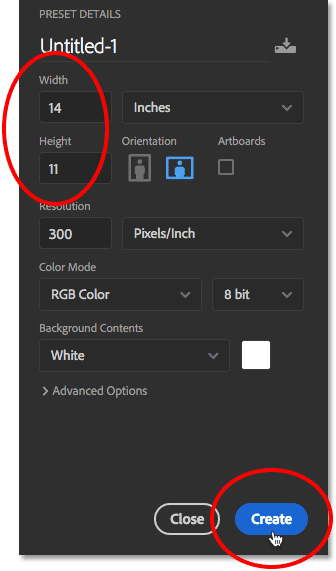 The selected image opens in Photoshop. Image credit: Adobe Stock. The image appears in the Recent Files list. Clicking the "Open..." button to open a different image. Selecting a second image to open. Selecting a second image to open. Photo credit: Adobe Stock. The Recent Files list now shows the last two images I opened. Clicking the List View icon. Clicking the Thumbnail View icon. Even though my Recent Files list only contains two images at the moment, it doesn't take long for the list to get cluttered with recently-opened files. 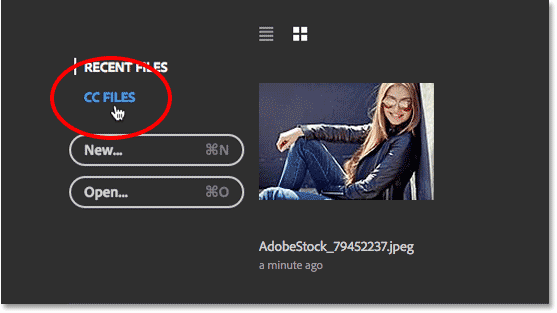 We can control the maximum number of images that will be displayed using the File Handling options in Photoshop's Preferences. Going to Edit (Win) / Photoshop CC (Mac) > Preferences > File Handing. The "Recent File List Contains" option in the File Handling preferences. 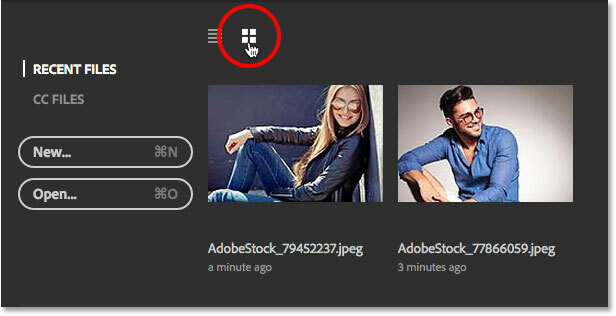 Along with opening files that are stored locally on your computer, the Start screen in Photoshop CC 2017 also lets us open files which are stored online in the Creative Cloud. 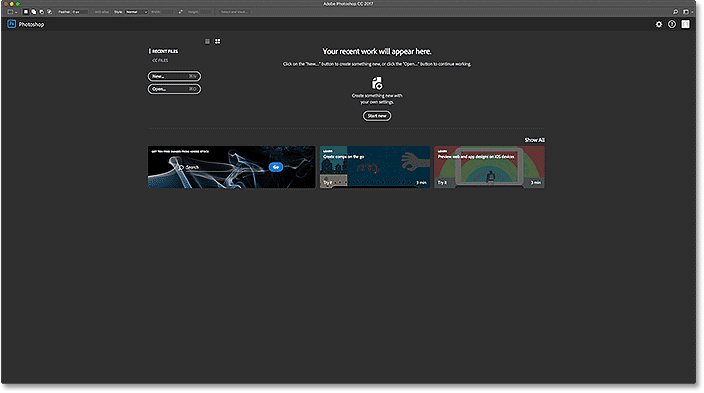 Every Creative Cloud subscription includes a certain amount of online storage space (the cloud), and saving our work to the cloud makes it easy to access it from any computer we need. The only thing to keep in mind is that the Start screen will only display files that were uploaded to the cloud as PSD files, which is Photoshop's native file format. 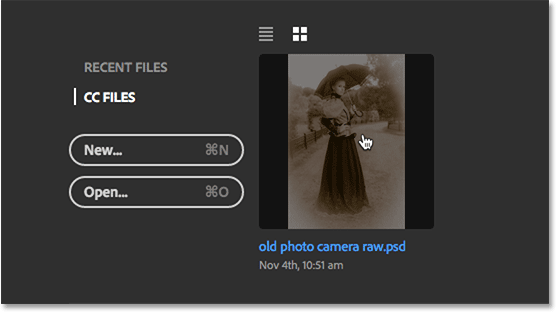 JPEG images or any other file type will not appear. 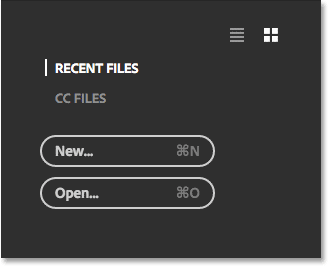 Clicking the "CC FILES" menu option. Opening a PSD file from the Creative Cloud. The PSD file opens in Photoshop. Returning to the Recent Files list. Going to File > Open Recent > Clear Recent File List. The Start screen after clearing the Recent Files list. Use the 'Show "START" Workspace When No Documents Are Open option' to enable or disable the Start screen. Of course, you may be wondering, "But how would I create a new document, or open an image, or access my recently-opened files, if I've turned off the Start screen?". 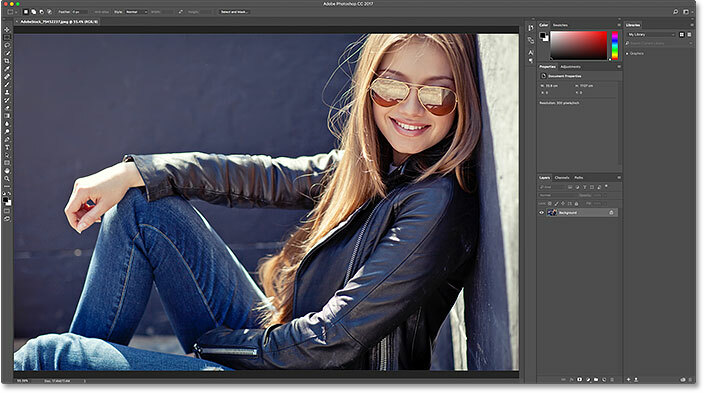 While there's no doubt that the Start screen serves as a great starting point, especially for beginner Photoshop users, the truth is that there really isn't much here that we can't do without using the Start screen. 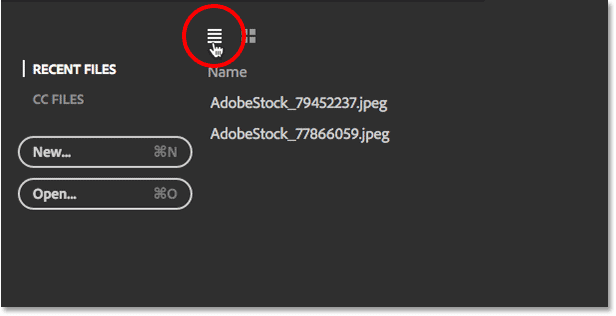 So if the Start screen begins to feel like unnecessary clutter and you decide to turn it off, in the next tutorial, How To Disable The Start Workspace In Photoshop CC, we'll look quickly at how to create new Photoshop documents and open images without using the Start screen.